True to form and working along their “assbackward” philosophy “Slaughterhouse” Sue Wallis and Dave “Doink” Duquette’s trumped up Native American complaint on Madeleine Pickens Rose Parade float totally blew up in their faces with the net result of garnering the Wild Mustang float an easy 10 times the publicity that it would have received if they simply would have stayed beneath that slimy rock that they live under. Chicago (EWA) – Sue Wallis, Executive Director of United Organizations of the Horse (UOH) and organizer of an upcoming meeting of horse slaughter proponents in Las Vegas has launched an eleventh hour attack on not just horses, but floats showing horses. HOUSTON, (Horseback) – A citizen journalist working for The Examiner.com has been sued by the government’s largest BLM “gather” contractor. 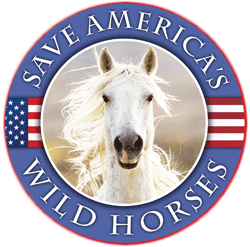 The suit filed in a rural Juab County, Utah district court charges Maureen Harmonay routinely misrepresented the facts in a series of stories on wild horse roundups in several western states. GLENVILLE, PA (Angel Acres) – With the US press awash with misinformation regarding the plight of the American horse, Angel Acres Horse Haven Rescue is stepping up to educate the public about horse slaughter via a billboard & internet campaign. Two billboards are up in Baltimore that display 2 horses with the statement, “Stop Killing Us” and a new website http://www.stopslaughteringus.com has been launched. It is said that you cannot teach someone Common Sense. This is the case with the mantra of illogical statements we hear from horse slaughter supporters. The statements, spoken with such authority, in fact either lack common sense or amount to nothing more than finding a piece of jello they can nail to the wall. Hey Bob Abbey, This One’s for YOU!